Zesty Ranch, Chipotle BBQ and Garlic Parmesan -- pick your poison. It took a while for the light to come on, but in its Northern Nevada locations McDonald's is testing its Shakin' Flavor idea with its iconic Chicken McNuggets as well as with its fries. The idea of putting fries in a bag and supplying one of several flavorings to shake on dates back to 2005 in Hong Kong for McDonald's. So-called Shake Shake Fries have been popular menu items or LTOs across Asia since. Last year, McDonald's began wide testing of seasoned shaker fries across the U.S. 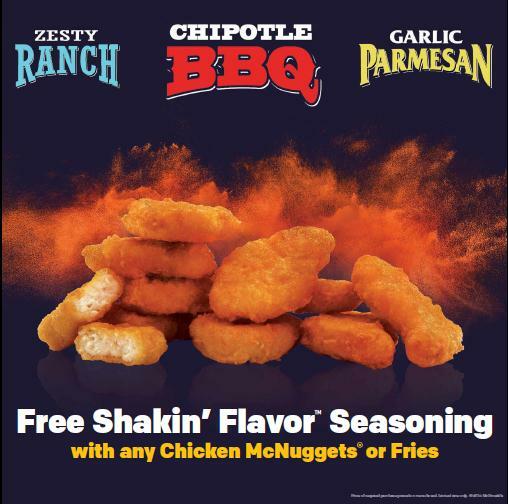 The new test--with Zesty Ranch, Chipotle BBQ and Garlic Parmesan seasoning options--doubles the promotional opportunity as the chain explores its new strategy of giving regions and co-ops more latitude in choosing LTOs and new products to feature.